The "shmup" genre is relatively niche but is also, among its devoted fans, one of the great pleasures in gaming. It's a difficult genre to create games for, however, as the nature of the gameplay is rather limited and simple, with innovations being hard to come by. After all, there's only so many ways one can pull off shooting endless waves of enemies while still making an original enough game that'll stand out from the pack. Karous -The Beast of Re:Eden- makes an admirable attempt at setting itself apart, but ultimately never manages to escape its own shadow of mediocrity. After booting up the game and pressing through a few menu screens you're almost immediately launched into the action. There's no exposition, no introduction, you just control the mech and shoot the enemies. Ordinarily, this wouldn't be a problem, as the shmup genre isn't necessarily known for its storytelling. However, an attempt is made at a deeper story, but it's so misguided and poorly done that it's unintentionally humorous. 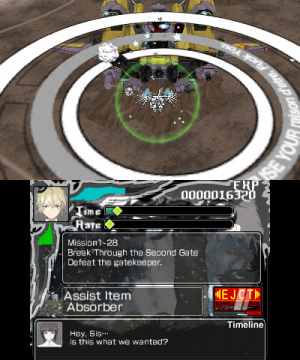 Everything is conveyed through a text box that's placed on the bottom of the bottom screen, quite literally as far away from the action on the top screen as possible. It's counter-intuitive to have to take one's eyes off of the screen to read the text in the middle of a mission, but that storytelling really doesn't make any sense to begin with. Phrases generate randomly and they range from painfully obvious, like "Enemies will retaliate" to downright strange, like "The death of Spring Rain happens every day. I wonder if the grave exists?" There's absolutely no effort made at providing context here; it's never explained who is saying what, why they're saying it, or what it actually means. The gameplay generally makes up for the nonsensical narrative, though it's by the numbers and repetitive. The controls are simple and easy to learn; the D-Pad or Circle Pad moves the mech, A button shoots, R button uses a melee attack, and L button drops a bomb. There are over 100 missions to partake in, each one pitting you against wave after wave of enemies until a specific objective is fulfilled. 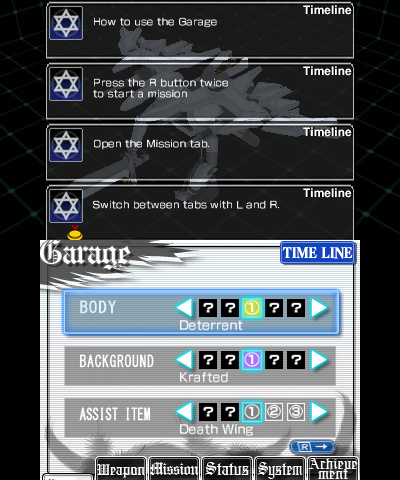 These are typically just variants of basic templates, like "kill x amount of enemies with this particular weapon", and most missions can be completed after two or three attempts. 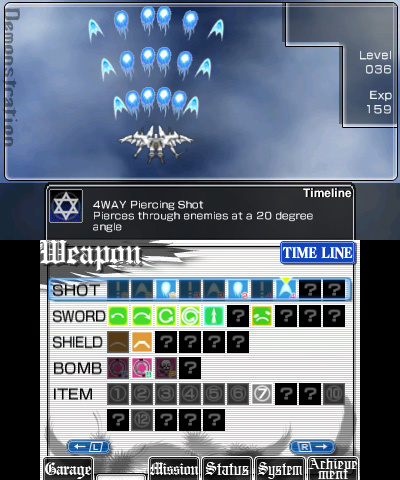 Upon completing or failing each mission, weapons and equipment items that were used will be levelled up to deal more damage and new weapons will be unlocked periodically.This helps keep the gameplay from growing stale, but your abilities level up far too fast, which effectively removes any difficulty from many missions as it's possible to steamroll through the pitiful resistance put up by enemies. The action is mindless and fun enough, but it plateaus only a few missions in and fails to ever progress into anything particularly captivating. The overall presentation gets the job done, but doesn't really make an attempt at rising above average. The graphics are nice enough, but this looks like it could've easily been a DS title; this is worsened by the fact that 3D is completely omitted, and if there's more than a dozen enemies on screen at once the frame rate noticeably chugs. Environments are monochromatic and mostly forgettable, with many being reused in later stages and colours swapped. The soundtrack is catchy and upbeat, but quickly grows stale and repetitive as you're subjected to the same small handful of tracks. 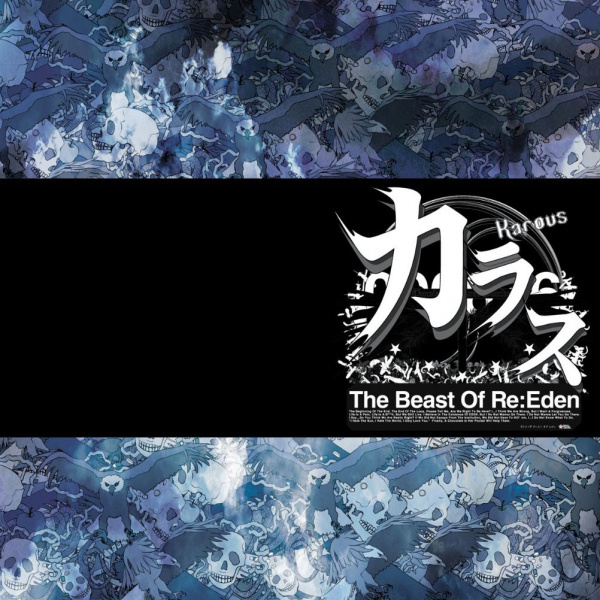 Unfortunately, Karous -The Beast of Re:Eden- is what could only be described as a painfully average game. Aside from the mess that is the story, it doesn't do anything wrong necessarily, but it doesn't do anything exceptionally well either. The general lack of creativity or innovation hold this back from being anything more than a mindless time-sink, resulting in a mostly forgettable shmup out of which only devoted fans of the genre will likely get their money's worth. That's so sad. I saw that Circle was publishing it, and so far, they always selected great game for the eShop to bring over. I might still buy it, only to support Circle in their effort to bring so many great games that would never leave Japan otherwise. Will put it on my wishlist if nothing else. Will have to see if there are any other reviews for it with differing information. Ever since the Demon King Box review, I've decided to give every CIRCLE game a try as long as I'm interested. This game here is among them - if there will ever be a PAL release, that is. Sometimes average is still a fun romp. I'll pick it up on payday. "what could only be described as a painfully average"
I told you this game was going to be terribly average. Why doesn't the review mention that this is the umpteenth release of Karous? Or any mention of the original developer? No? Just this odd "Klon"? How about doing the slightest bit of research? I'm with others: I think I'll be getting this regardless. I'm looking forward to wonky dialog and explosions. @SirQuincealot No. Published and localized by CIRCLE. They didn't have anything to do with the actual development of this. I don't think I've bought a single game CIRCLE has developed or published and this would've been the first. I love shmups as much as the next gamer, but I don't like supporting what looks like mediocrity; it doesn't help the industry. I'm glad YouTube and NL encouraged me to pass on this. Awwwww... I was pumped for this. Rats! It's a decent game, I may enjoy it considering I still enjoy the Dreamcast original. I imported the physical release from Japan and to be honest I would've given it a 7. As a shmup fan I find it very innovative for the genre, just would've preferred longer levels.. The only thing that stopped me fully enjoying it was not reading Japanese and therefore unable to understand certain mission requirements, was helped out by some kind English speaking Japanese people on Miiverse! Basically, if this is released in the PAL region I'll definitely buy it again, hopefully Klon's Japanese aShop shooter Illmatic Envelope Dillinjah will be released to the rest of the world too.. That game's awesome! I played Karous back on Wii (when it was released in the pompously named 'Ultimate Shooting Collection' compilation disc) and did not liked it in the slightest. Circle is the go to publisher for localizing niche digital games on 3DS (like a smaller XSEED) but yeah, not everything they touch is gold. And I say that as someone who got Demon King Box and Dark Witch at the first chance. While Karous is not my taste, I will always keep an eye on everything Circle decides to bring. I'd like to give it a go - if it gets a PAL release.....please!? @Yomerodes Same here. Despite Karous being the star of the show in that collection, Radio Allergy was the only one remotely worth playing. 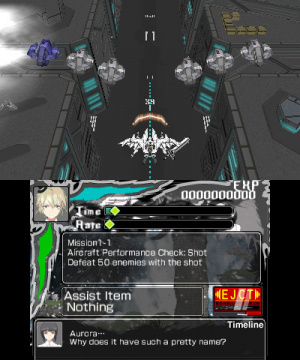 Unfortunate Klon and CIRCLE didn't bring a better quality niche shooter to the 3DS.